Our Villa is located in the village of Mellieha which is one of Malta's most picturesque tourist destinations. The town centre boasts of its culture, historic sites, fine restaurants, traditional shops and sandy beaches. Mellieha is an excellent place to spend your holiday in Malta. Since it is located in the north of Malta, one can easily go to Gozo or Comino for a day. Crossing over from Mellieha to Gozo is easy and would just require a 5 minute drive to the Gozo ferry terminal. Mellieha is ideal for those guests looking to be relatively closer to the sandy beaches. Apart from its own sandy beach, Mellieha Bay, one can find nearby beaches such as Golden Bay, Ghajn Tuffieha and Paradise Bay which are all beautiful beaches ideal to spend a day at the sea and all within a 5 minute drive from the villa. When you come out of the airport follow signs to Gozo Ferry all the way north. Go past St.Paul's Bay and Xemxija. Keep following signs to Gozo or Mellieha. (Mellieha is the last village before boarding the Gozo Ferry). 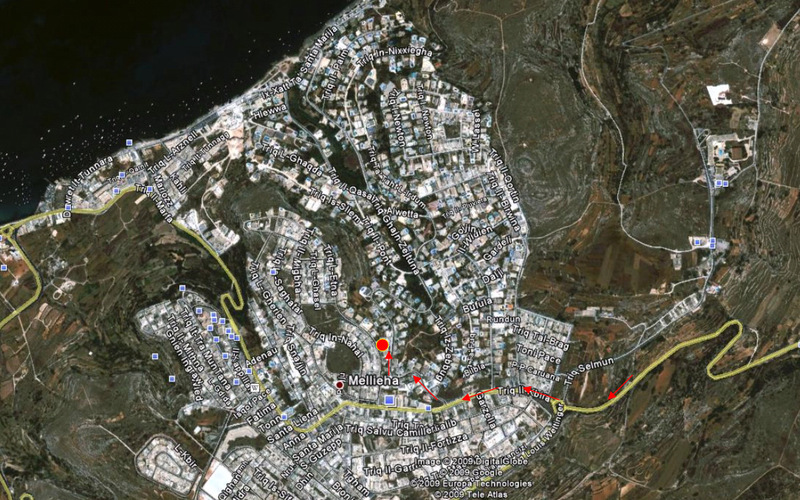 Up the winding hill to Mellieha you come to the roundabout. Take the 2nd left exit from the roundabout and keep on the main road. Take the third right turning to Santa Maria Estate (opposite Shoppers Supermarket). Approximately 300 meters down the road past the second bend is Ringway Villa on the left hand side. Villa No.2, Ringway Flats. The village of Mellieħa has been officially recognised as one of Europe's top "off-the-beaten-track" destinations primarily because of its sustainable approach to tourism. Congratulations Mellieħa people for the well-deserved EU award. Mellieħa is one of the nicest and most picturesque towns in Malta. Besides the Red Tower and the war shelters, there are quite a few other places of interest, namely it-Torri l-Abjad near Little Armier and L-Għar u Casa (unfortunately, both privately owned). Also the beach at Mellieħa Bay (l-Għadira), Armier, Ċirkewwa, Santa Maria Estate, Il-Kortin, Popeye's Village, the Wild Life Refuge and of course Il-Madonna ta' l-Għar. One must not forget the sanctuary and the little chapel at lands end, past Armier, which the Mellieħin (people form Mellieħa) commonly call Tal-Kunċizzjoni. From Mellieħa, one can enjoy spectacular views, with Comino and Gozo in the distance. And how can anyone miss the church sitting on top of the hill? Mellieħa is unique and has some of the nicest people living there, so it is no surprise when it was recently named a European destination of excellence. Everybody's favourite song is, after all, Il-Bajja tal-Mellieħa, sung by the late Sam Bartolo together with The New Cuori! No wonder Mellieħa is the most sought-after town in Malta to live in. Mellieħa celebrates the feast of Our Lady of Victory on the 8th September each year. This is celebrated also during the week by the bands of both clubs in Mellieha and on the eve of the feast there are a lot of ground fireworks and sky fireworks. Mellieha is the last village before boarding the boat to Gozo. The Maltese are predominantly Roman Catholic and speak Maltese (which is the native language), which being a semitic language can somtimes be similar to Arabic. Both Maltese and English are official languages with Italian being also widely spoken. This little island, set in the Mediterranean twixt Italy and North Africa, has a gorgeous climate, friendly residents, a rich history and architecture to match; but I wanted to know what the food is like, so off I went. I’ve already written about the honey, olive oil and wine of Malta, but what are the principal dishes all about? 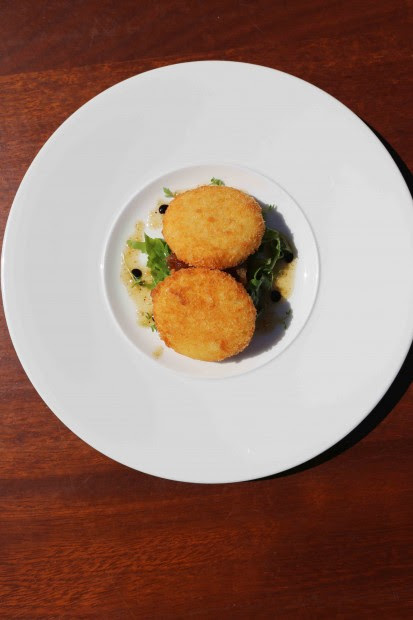 What is the essence of Maltese cuisine and who is taking it to the next level? Firstly let’s get one thing out of the way; the portion sizes here are epic… crazy huge and massively generous. I had to check that I wasn’t expected to eat the whole lot. Not exactly austerity and I certainly never condone wasting food, but that’s the culture and who am I to argue against that – especially with my appetite? So let’s take you through a day chronologically; many Maltese, especially working men, often skip an early breakfast, choosing instead to go to drink sweet tea and eat one of the naughty pastizzis from any one of hundreds of shops offering them all over the islands. I’m taken by my guide to ‘the best’ in Rabat, just below the walls of the incredibly atmospheric medieval city and ancient capital of Mdina – it’s called Crystal Palace, presumably not after the London footie team but some Moorish dwelling of old! 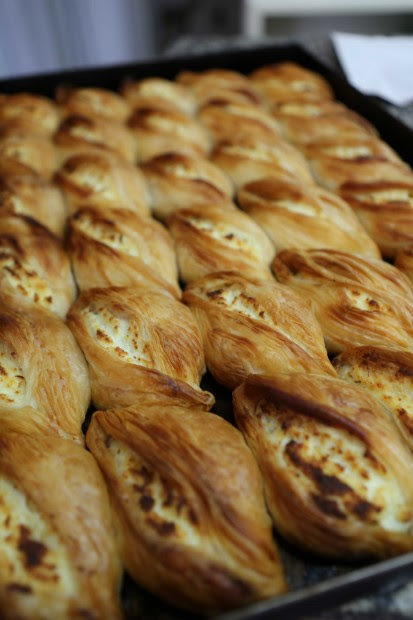 Now, pastizzi is essentially a flaky pastry pasty similar to the Cornish variety, and either filled with peas or cheese. I had both… and a sweet tea. The pastry makes for lovely, naughty eating with a strain on the morning metabolism for someone used to porridge, but the tea launches energies back up again. 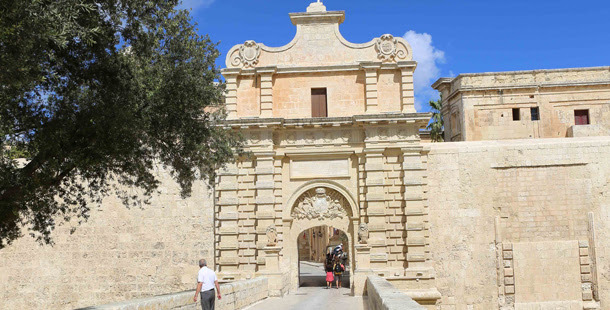 Mdina is a glorious walled city (and the most sought-after postcode in the country) with winding narrow streets, elaborate balconies, bougainvillea-clad facades and horse-drawn traps (tourist traps! ); only residents of the city are allowed cars, so it’s quiet, safe, clean and – with the honeyed-stone reflecting the burning sun – lovely. After a gander around this UNESCO World Heritage Site, my thoughts were turning to lunch – apparently I was to have two. The first one of local produce created by chef Damian Ciappara at Commando in beautiful and sultry Mellieha in the north of the island next to where the fabulous Gennaro Contaldo was filming for Jamie’s Food Tube channel in the village square, and another, which I was dreading and will tell you all about in a mo’. So off to Commando first, where Damian showcases the finest in Maltese produce; the amazing honey (read about my visit to the local hives), chutneys, vegetables and cheese. The cheese of Malta – Gbenja – is a pretty ubiquitous affair. It is generally sheep’s milk, eaten fresh like a mozzarella or air-dried and often rolled in pepper and pickled in vinegar, herbs or left naked. The air-dried version has a nutty piquancy that is lovely. It is often mixed into a pasta or grated onto pizza. As an Englishman who has the choice of 100-odd cheeses in every cheesemonger and supermarket, I’m guessing the rule here is if you are going to do one thing, do it well; and they do. Here’s a picture of me milking a goat in Gozo to make a batch with a local farmer – goats as well, as sheep are used for the Gbenja. As a starter Damian had deep-fried his Gozo cheese for me and served it with a walnut dressing. It was gorgeous, and held its flavor despite the hot oil bath. It oozed like a cooked cheese should. 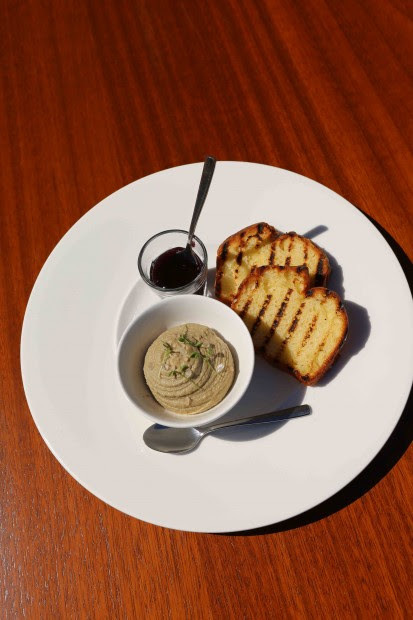 Then I was dished up some chicken liver pate – a more strained and softer version than Brit offerings – served with a grape jam made with the fruits of the local winery. I’d drunk some of the wine the day before and you can read about why I think the Chardonnay was a revelation here. They love dessert here in Malta – amazing considering the size of the other courses and Damian brought out something really special – a filo-baklava-type pastry filled with candied peel, clove flavouring, dates, tangerines and rosewater. 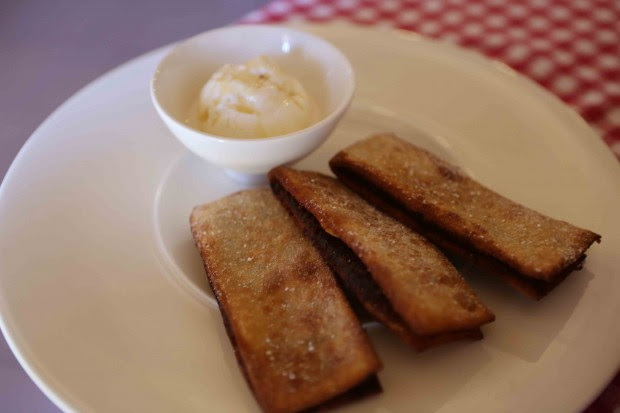 Deep-fried and served with honey ice-cream. Hot, fragrant, sweet, naughty, nice; I could have eaten three of them. It was full of wonderful Christmassy stuff that really finished off the meal in style, even though the temperature was in the hundreds outside. Damian was a genuinely passionate host and was animated telling me about local produce and how contemporary chefs are making it more accessible to modern-thinking tourists’ palates. An hour later and I’m staring down at my food hell, which is probably the closest thing to the national dish, so I had to be polite and get stuck in. To make matters worse there were two MASSIVE courses of this stuff. Rabbit. I just don’t like it, there is something lurking in the background that I find nasty, a leathery twang that leaves me super-thirsty. A huge bowl of rabbit ragu with pappardelle pasta ribbons was first and I managed pretty well. The chef told me he had slow-cooked it with wine and herbs so I concentrated on those aspects of the flavour and managed half of it. 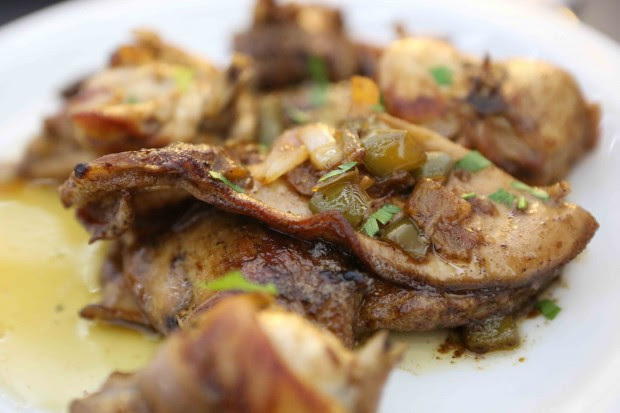 It was all right – rabbit lovers would have gone bonkers for it – but then came the real challenge; slices of rabbit belly and what looked like a ribcage. I love you Malta, but I would struggle to find anything I would rather not have eaten; saying that, your natives and many tourists enjoy it and that’s a good thing. After a stroll around the quaint, colourful fishing village of Marsaxlokk, a bit of the very cool 5-D experience in Valletta, a pint in boozy legend Oliver Reed’s ‘last drink’ tavern close-by I was ready for dinner. 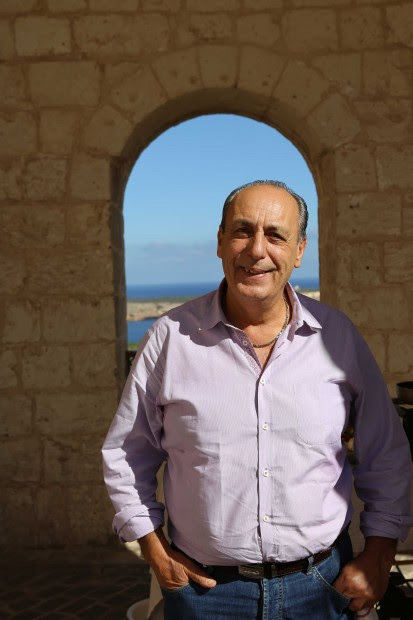 Julian Sammut runs a string of independent restaurants around the former fishing harbor at Spinola Bay, and he has been named restaurateur of the year for his focus on Maltese foods. 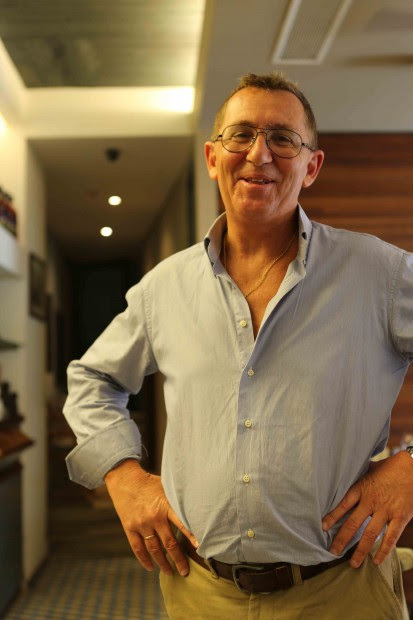 I was to meet him at Gululu, a restaurant on the waterfront with a focus on reinvigorating ‘peasant’ food for the burgeoning food scene – that’s not to say it’s poor man’s food by any means. I was told to prepare for a lot of food – unsurprising considering the Maltese appetite – although I did offer the caveat that I wanted no more rabbit! A fish soup, good enough to challenge any French bouillabaisse was first; rich and peppery like it should be. Then some lampuki or dolphin fish (no not dolphin, dolphin fish) served simply grilled or braised with tomatoes, olives and woody herbs. It’s meaty and reminded me of Dover sole a little. The fish itself is only found at this size in these waters, swimming between Malta and Gozo before heading west to American waters before it becomes the more familiar mahi-mahi. It’s fished by tempting it into the shade before dropping a net – clever stuff. Julian is a lovely guy – we chatted about rugby and cricket as well as food, our shared passions. The guide sat patiently while we chewed the cud and four hours later we were nearly done. The generosity of spirit in these islands is really infectious, welcoming strangers until they become friends – there is a cheeky sense of humour as well as a commitment to great service, something becoming less of a priority in other Mediterranean countries. Julian then asks chef to whip up some ad hoc local specialities, especially once he found out I loved anchovies. 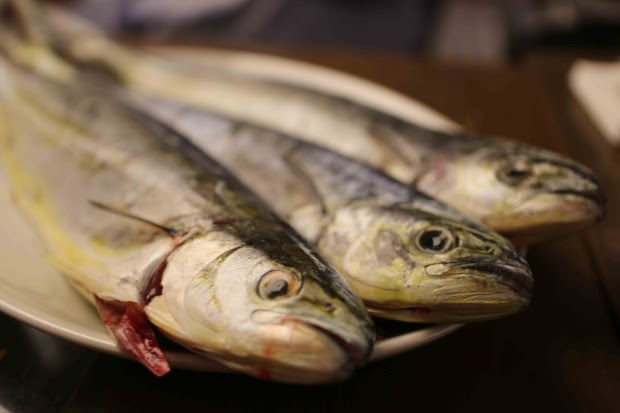 He produced local Gbenja stuffed with a super-salty anchovy and deep-fried. Words fail me – it was about as perfect as it gets. 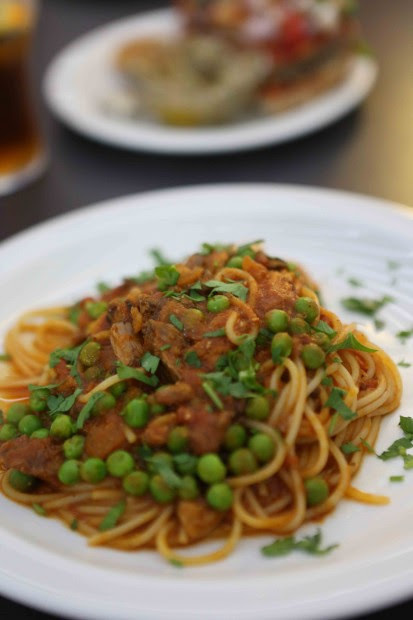 I must take a moment to tell you about the remarkable and unique Maltese tomato paste – it’s astonishing. Sweet sun-dried tomatoes are bashed up for hours with a range of secret ingredients from rosemary to sugar. It is a reserve, will last for months and is simply glorious spread on some freshly baked bread – an astonishing and surprising thing which the Maltese love. After leaving Julian’s lovely restaurant I walked back to the hotel in Valetta – lively, friendly and obsessed with Maltese classics. These are coming back into fashion with the younger generations who are fighting to keep them alive. I spoke to some younger people, asking them firstly about rabbit and nearly all of them said they tolerated it when their families sat down to eat it together rather than loving it, but all of them agreed it was worth saving….and so do I. For more information about the culture and tourism on these islands go to the Visit Malta website.